Able to measure the gasoline transmission rate through tubes, small fuel tanks, etc. Place the samples such as tubes or tanks into special cells and fill the samples with gasoline. Place the cells inside the temperature-controlled oven. The permeate of gasoline etc. through samples are purged by purge gas. 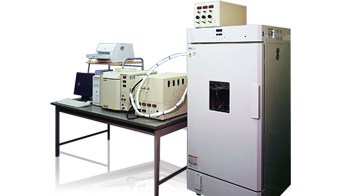 This purge gas is sampled at regular intervals, introduced into gas chromatograph, separated into individual components by the column of gas chromatograph, and then gas transmission rate of the individual components is calculated. Ability to separate permeate into each component and measure transmission rate of gasoline or simulant gasoline such as CE-10. THC is also available. High sensitivity method can measure 1 piece of small product. The circulating supply of gasoline etc. is available. Able to measure permeability of the vapor. For permeation or evaporation measurement of gasoline through tubes, fittings, small fuel tanks etc.